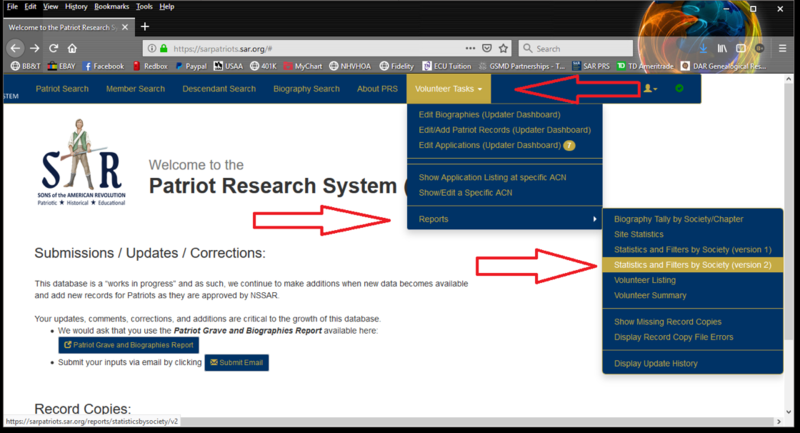 Once approved for Record Copy input you will get an email from the SAR Patriot Research System to reset your password. Do not use the same password as your normal SAR website password. ​This brings you to the main SAR PRS screen. 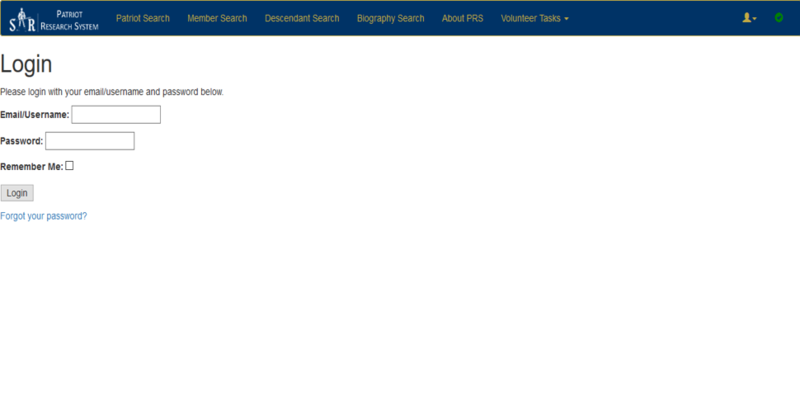 In the blue bar, look for “Volunteer Tasks” on the far right. 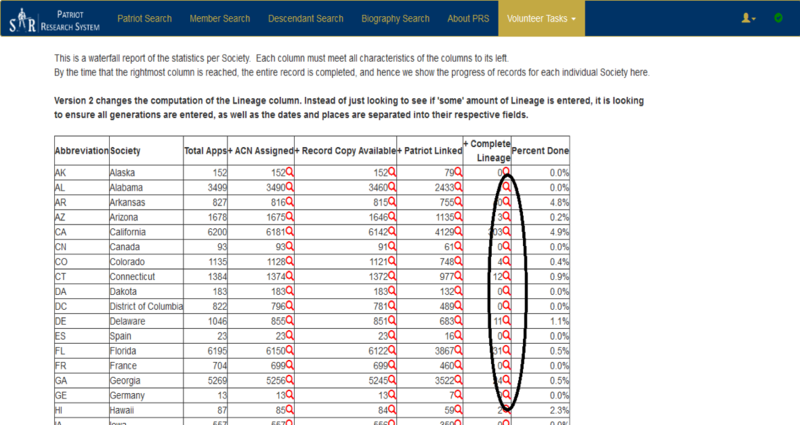 Look for the column labeled “+ Complete Lineage”. Click on any Magnifying Glass to the right of the number. This will open a new browser window to view the original SAR Record Copy in PDF format that contains the information you will be typing into the system. Download the document.pdf file to your desktop and close that browser window. This info from the SAR Record Copy PDF needs to be input into the Application Info page. Step 8. Click the green “Get Patriot Info” box. This will populate the Patriot name into the Patriot name box. This will also initiate the connection to the patriot on the application for later use by a reviewer. 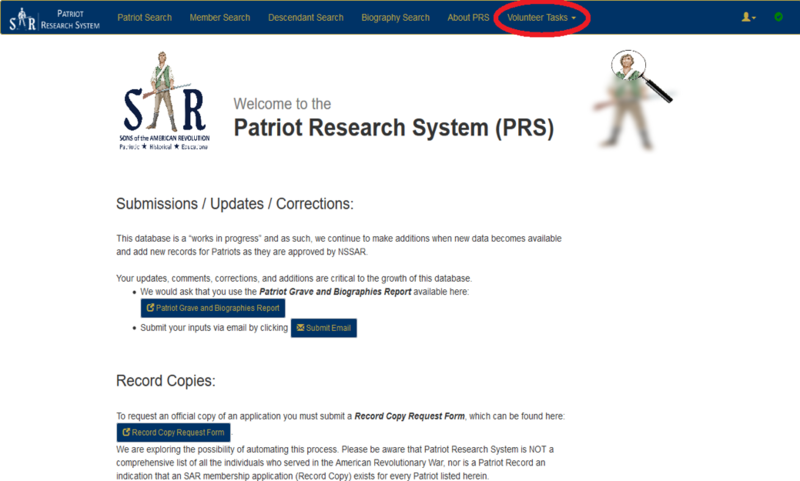 Make sure the full Patriot name is in the Patriot name box under the Patriot Info header. Do not add the rank. 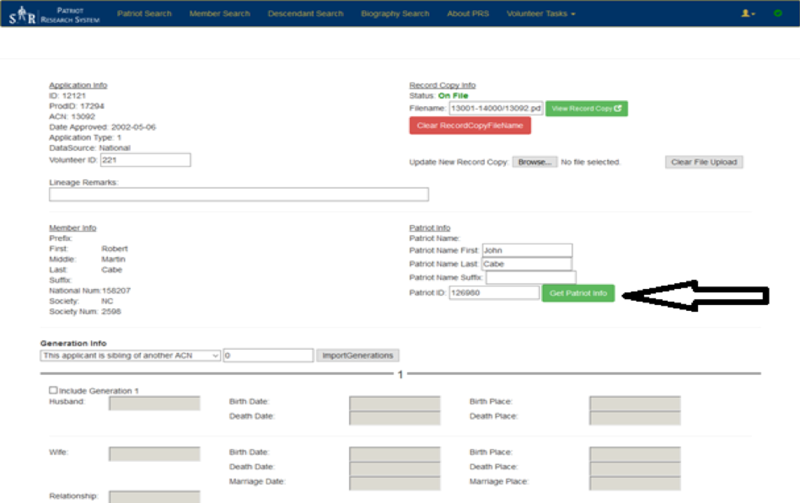 Enter the lineage information EXACTLY as on the approved Record Copy. Do not worry about privacy; the only generations that will show to the world will be from Generation 4 to the Patriot. Step 10. Start by checking the “Include this generation” box for the first generation and then enter the information. This will remove the gray and allow you to input data into that box. Enter data if it is marked up (corrected by a historian). 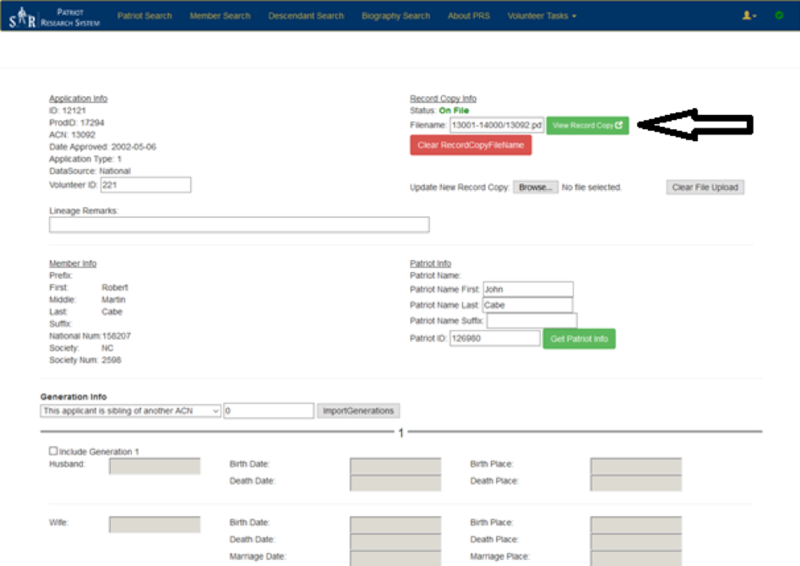 Enter all corrected data such as a date change. Do not enter any data if it is bracketed (i.e. Nicknames etc.). Do not use a period after any abbreviations. If there is a question mark (?) on the Record Copy do not input that information. Leave it blank. Once the information for the generation has been entered, add “son” or “daughter” to the relationship box. Go to the next generation and repeat Step 10. The standard date format used by the SAR and all lineage societies is in the form “DD MMM YYYY, rather than “01/10/1900”. Dates in the latter format are unacceptable because of their ambiguity: this date could be interpreted either as 10 Jan 1900 or 01 Oct 1900. The month should be abbreviated using the 1st three letters of the month only. Date Abbreviations - The below prefixes are to be used with dates. They must include a date typed into the box AFTER the prefix. If there is no date or the date is unknown, then leave the box blank. Use the two letter abbreviations for the state only. Always use a forward slash to separate. Enter them as City or Township, County and State (i.e., Sparta/Sussex/NJ). If you have any questions at all, have concerns about your data input, are unable to complete the application that you started or are just not sure of your input, you can just click “Update Changes” and it will be saved to your dashboard to finish later. If you need more explanation that what is written in this document, contact your volunteer advisor for further steps to complete the update.